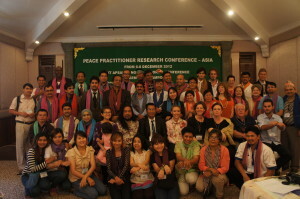 In December 2012, CPCS hosted the first regional Peace Practitioners’ Research Conference (PPRC). The conference convened 60 participants from more than 20 different countries in Asia. Thirty Action Research papers were presented and discussed over two-and-a-half days on a broad range of topics, such as the role of media and IT in peacebuilding or how land and environmental issues are closely linked to peace and conflict. The conference was a great success, marking the beginning of a journey towards many more yearly regional conferences serving as platforms for peace practitioners, scholars and academics for networking, exchanging experience, comparative learning, sharing best practices and extracting peace building theory from successful practice.